A digital piano is a modern electronic musical instrument designed in the way it feels to play, and in the sound it produces to provide an accurate simulation of an acoustic piano. It will however NOT sound and feel like the 'real thing', because you cannot replicate exactly the polyphonic effects of string tension on an iron frame, or the natural resonance of a damper system, and strings freely vibrating. Portability - Easily taken from one location to another. Fits into many cars with the seats folded down, and far easier to deliver to basements or upper floors. 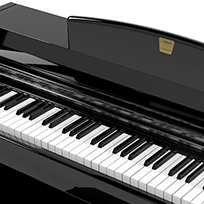 Digital pianos can often be a stepping stone to a real acoustic piano, or a useful second instrument in another location. Clever marketing by manufacturers has attempted to sell the digital piano as the real thing, and we feel that where possible and acoustic piano should be the first choice, especially where beginners are concerned. It is so important in the early stages to develop the strength in the back of the hands and fingers to encourage individual dexterity giving control for expression and intonation at a later stage.